Jim helped teach a whiskey distilling class that I attended with my son several months ago. With law enforcement in my family, I immediately recognized the calm strength of character that radiated from him. That sense was repeated when I heard him as the keynote speaker at the ADI conference later that same year. 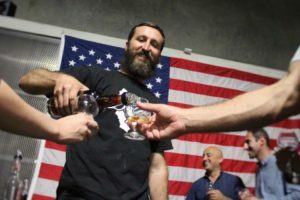 His work helping to get the California Craft Distillers Act of 2015 is greatly appreciated by everyone working in the California craft distilling industry. His passing is a tragedy in many ways. He will be missed, but remembered. My thoughts and prayers go out to his family and friends suffering with their loss. Deepest Condolences from the BOWER HILL Boys here on the east coast. Although we never met Jim what he was doing is in our hearts as well; a common thread for the love of whiskey. GODSPEED…. He is missed! A rock of a man and one of the best! Learned many things from him. Rest easy Jim.